This is a guest blog written by Siobhan O’Rorke of Zenkit. In October 2016, Zenkit was released as an app designed to help you ‘organise anything’, enabling companies to digitise all of their business processes in a single app. It’s innovative approach to presenting data has since garnered worldwide attention, and high demand for desktop apps led to the release of apps for Windows, macOS, and some Linux distributions in February this year. 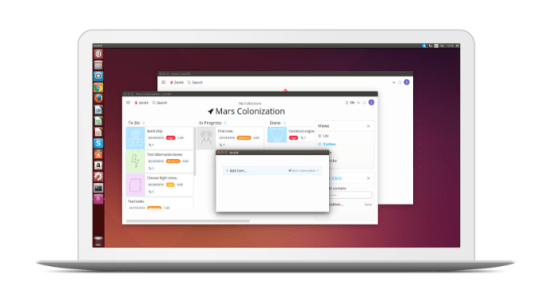 This week, Zenkit has been released as a snap – the universal Linux packaging format – fulfilling the team’s desire to make Zenkit a platform and device agnostic tool. Zenkit started out as an app builder, with the intention of letting companies build the tools they need on our platform. In developing the app builder, we built an extensive back-end that could support varying app complexity, ranging from simple to-do lists to be used by individuals, to highly complex business processes and relational databases. We quickly realized that people would benefit more from a simple, flexible interface with certain ‘tools’ that they could customise to suit their needs, rather than having to build the tools themselves from scratch. That’s how we developed the different Zenkit views – Kanban, table, calendar, list, and mind map. Since it’s release, we’ve strived to offer more flexibility and even more customization options to our growing user base. Part of this was to be able to offer Zenkit on as many platforms as possible, including on as many Linux distributions as we could. We built our desktop apps as progressive web apps, packaged with Electron. We decided to use our existing code base in a PWA so that we could deliver all features of Zenkit immediately and maintain feature parity with the web and mobile apps. It also means that we can push updates to all apps simultaneously. We created the snap version in much the same way, using the existing structure and packaging it to fit the snap format. Use custom fields to track and manage the data that matters to you. Mirror any business process, from project management to customer care, in one app. View your work as a Kanban board, mind map, task list, calendar, or spreadsheet. Customise your views to match your preferences and the task at hand. Work offline on the web, on our mobile apps, and on our desktop apps. We want people all over the world to be able to have a great experience with Zenkit. Desktop apps are the best way to provide the purest experience, however developing for all of the different Linux distributions proved to be difficult. Providing Zenkit as a snap means it’ll be available to users of over 10 distributions, allowing us to reach the growing community of millions of Linux users. The benefits of snap, such as the quick installation, automatic update process, and easy rollback are the cherry on the top.